A friend of mine brings her child to an orthodontist that has a large video screen filling the entire wall behind the reception desk. The video that plays in continuous loops on that screen? Fish. Swimming in an aquarium. Did you know that studies have proven that looking at aquarium fish reduces stress and tension? 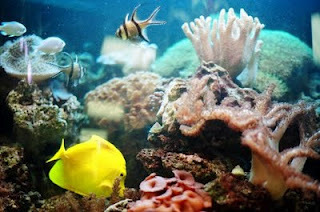 (Check out this article on the Health Benefits of Aquarium Fish.) The best part of the article states, "Seniors who were provided with an aquarium filled with fish had significant blood pressure reduction. Watching fish has been shown to calm children who suffer from hyperactivity disorder. Dental patients who were subjected to hypnosis vs. an aquarium experienced the same or greater benefit from the aquarium. Other studies have shown that dental patients required less pain medication after having watched fish in the office. It's little wonder that physician offices, dental clinics, and even waiting rooms for counselors have traditionally kept an aquarium in the waiting room." Personally, we prefer the real live thing to a video screen, since staring at video for too long isn't good for your vision or your brain. We get regular calls to install aquariums in doctor's offices, waiting rooms and hospitals - stressful places that can benefit from a reduction in tension. Perhaps you should have one installed in your office for when work is getting too intense. Outdoor Koi Ponds can have the same calming effect. Sitting beside the pond, watching the lovely fish swimming back and forth peacefully can be just the thing you need after a hard day. Some people take up hobbies to relax and unwind - gardening, exercise, sports. Me? I unwind by sitting and watching the aquariums and pond I love. It's the best therapy I know.